The PBS documentary on the rise and subsequent fall of the KKK in North Carolina in the 1960s, which aired last night, is far more watchable than the book it's based on is readable. 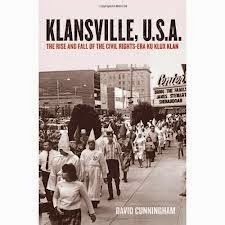 The 2012 book by sociologist David Cunningham, “Klansville U.S.A.: The Rise and Fall of the Civil Rights-Era Ku Klux Klan,” unfortunately reads like a book written by a sociologist. It's a tough, weary slog. The vintage film clips of KKK rallies and speakers in the PBS documentary makes real and immediate what the book was a long way from illuminating. There certainly are sociological lessons to learn about why the most "moderate" state in the South produced such a vibrant KKK. The place to start is probably the threat to the status quo that the entire Sixties represented to the general populace. Hippies, anti-war protesters, black power promoters, women's liberationists -- what a stew of individuals unwilling to sit at the back of real and imagined busses! Scared the hell out of people prone to affiliate with groups like the KKK.